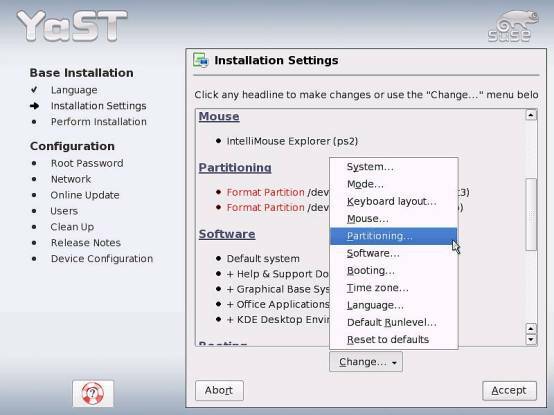 - Install Juzt-Reboot using "Advanced Install"
- Partition your hard drive from the Juzt-Reboot FDISK menu. Note: Partition sizes can be set to whatever required. - When FDISK install operation is completed press [ESC Key] to save & exit. 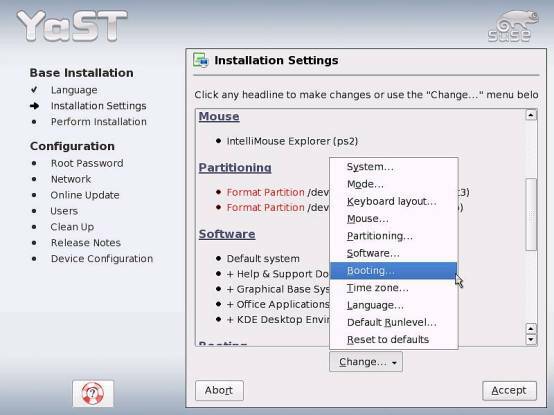 - System will now reboot and the Juzt-Reboot multi boot menu will appear, place Linux disk in CDROM drive and select boot partition from menu by pressing [Enter Key] to begin install. 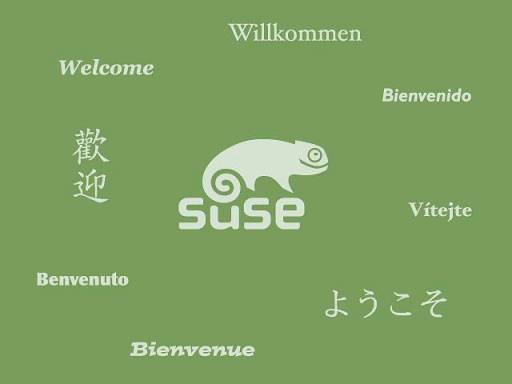 STEP 2: Begin Linux Suse Install > Press Enter to “boot”. 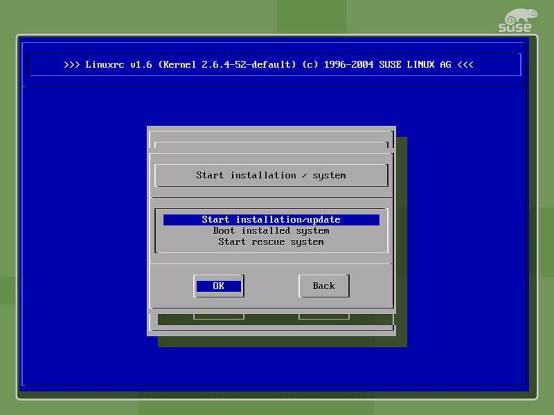 STEP 3: Select “Manual Installation”. 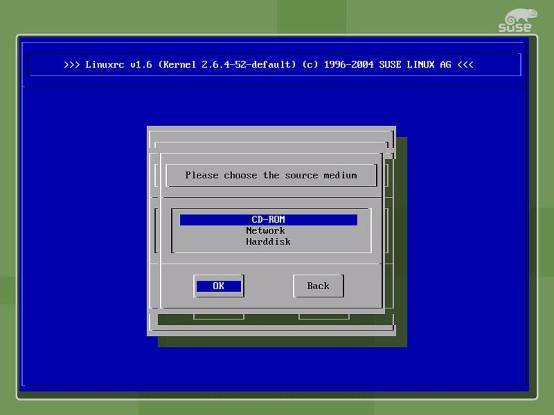 STEP 4: Start loading Linux Kernel. 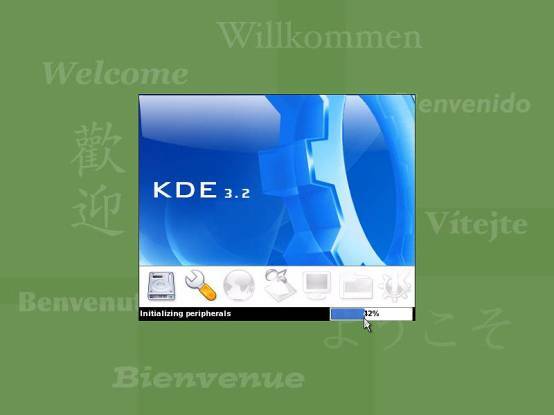 STEP 5: Select Language > English is the default. 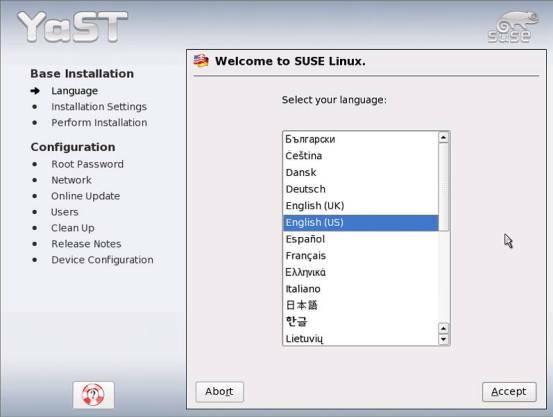 STEP 6: Setup Keyboard > U.S. English is the default. 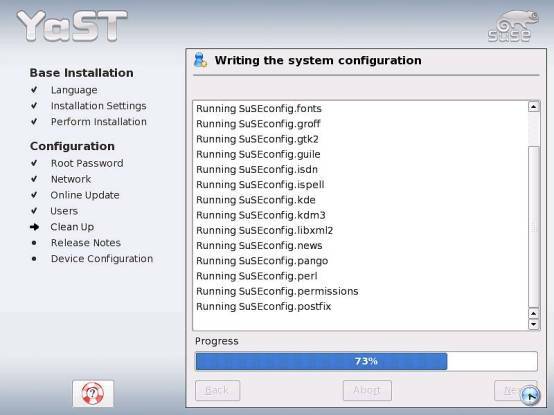 STEP 7: Install > Select Start installation. 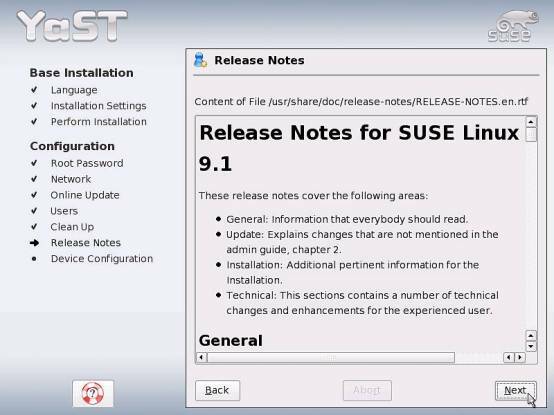 STEP 8: Select > Start installation Update. 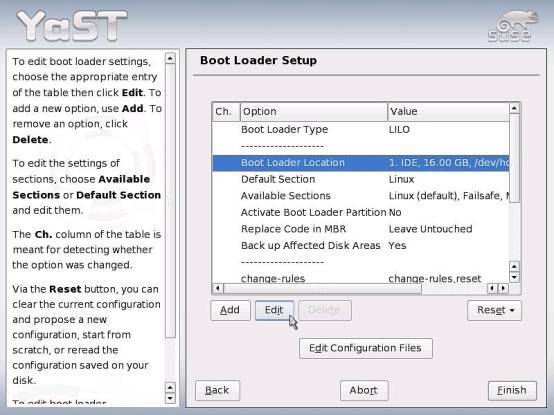 STEP 11: Finding Device > To load the driver [OK] or [Cancel] to continue. 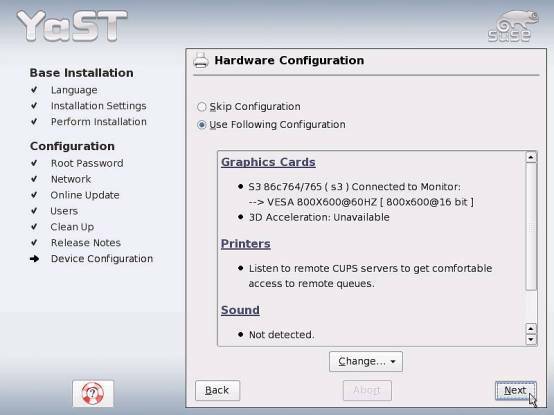 STEP 12: Installation Settings. There are two settings that must be changed. 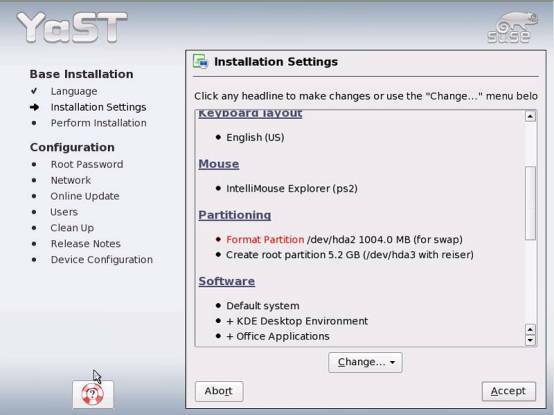 STEP 13: Click “Change” and select “Partitioning”. 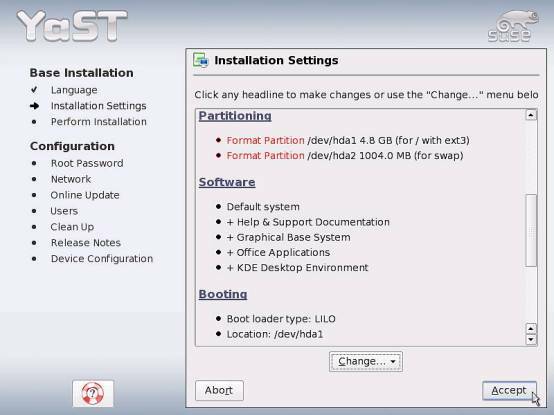 STEP 14: Choose the third option “Create custom partition setup”. 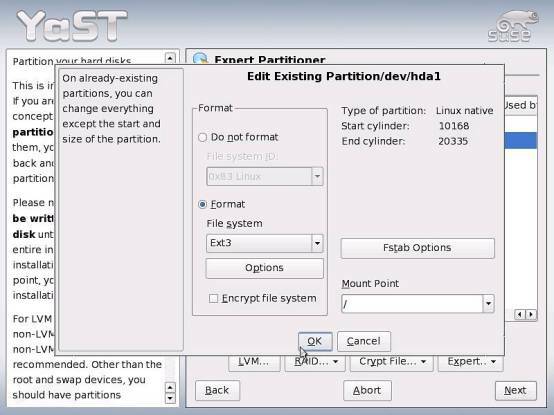 STEP 15: Choose Custom partitioning for experts. 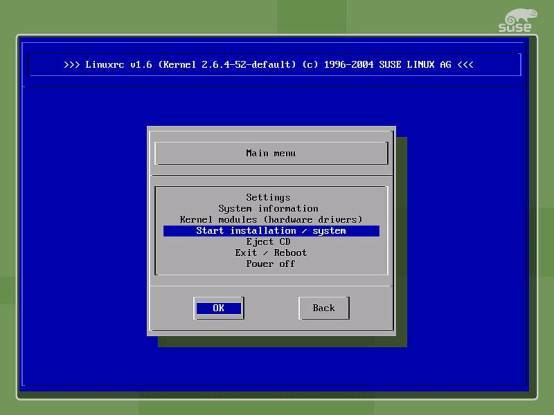 STEP 17: Partitioning screen displays. 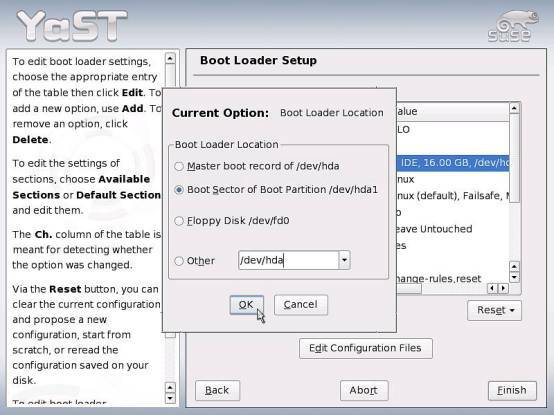 Setup /dev/hda1 File system to ext3” and Mount Point to “/” Setup /dev/hda2 File system to“swap” Click OK and Next to continue. 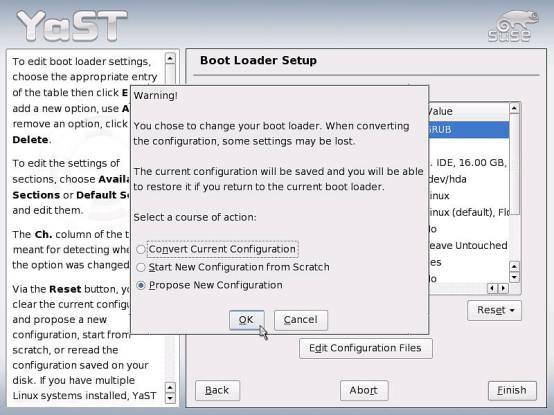 STEP 18: Back to Installation Settings and select Booting > Boot Loader Setup. Boot Loader Type: You can select either GRUB or LILO. Here we choose LILO. 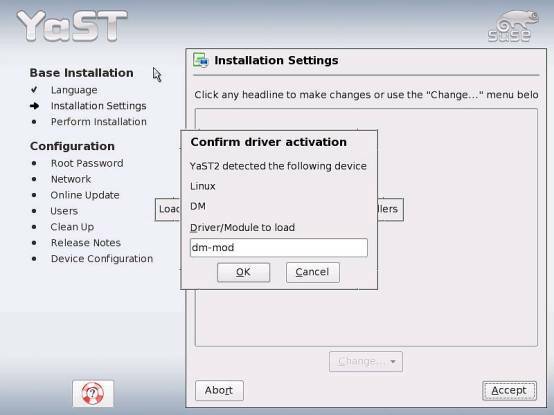 STEP 19: Warning message appears after changing the settings. Choose “Propose New Configuration”. 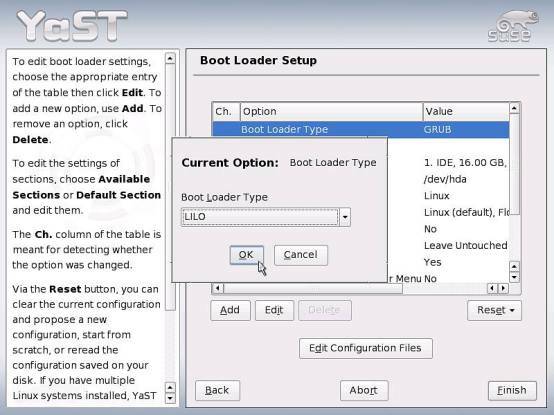 STEP 20: Boot Loader Setup > Select Boot Loader Location and click Edit. 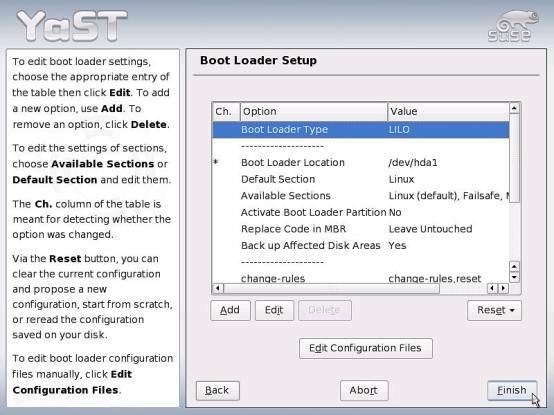 Choose Boot Sector of Boot Partition /dev/hda1. STEP 21: Click Finish after Setup. 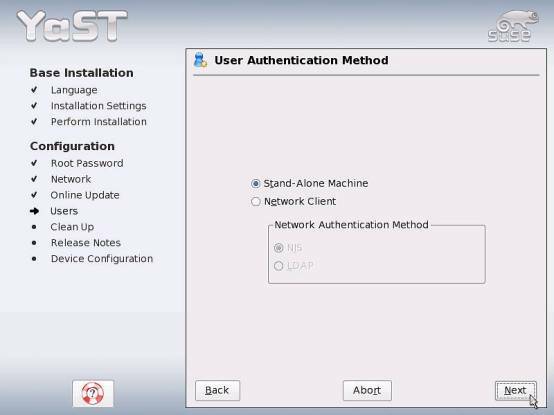 STEP 22: Back to Installation Setup and select “Accept”. 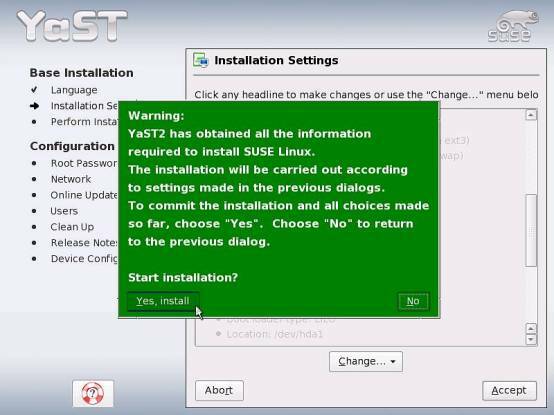 Warning message appears, Select “Yes, install”. 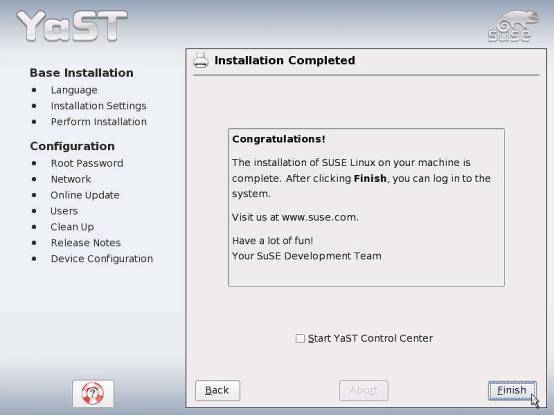 STEP 23: Start Installing. Wait for the installation. STEP 24: First entry after installation will show some device finding screen, to install press Continue, or press Skip to exit. 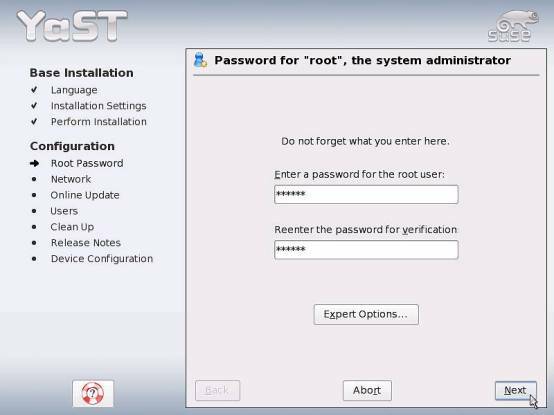 STEP 25: Setup Root password. Suggest 6 or more characters for password. 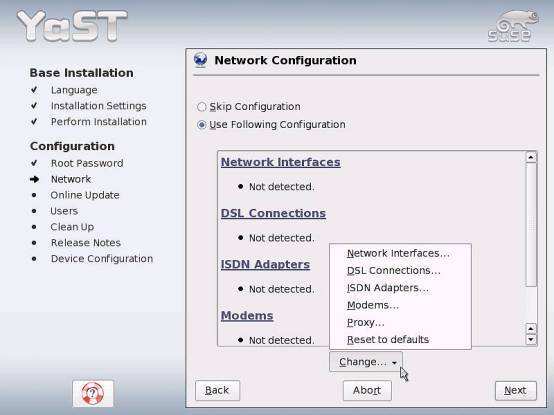 STEP 26: Network Configuration. Setup by users. 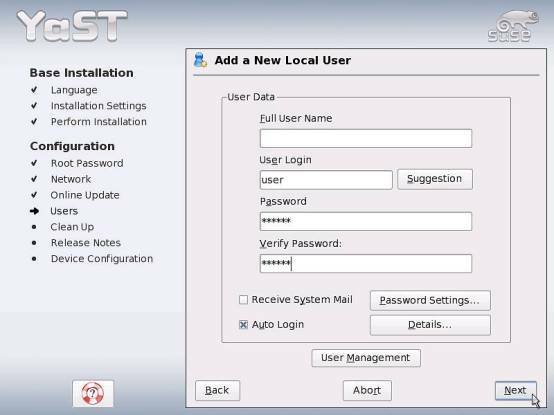 STEP 27: Add a new local User and press Next to start loading settings. 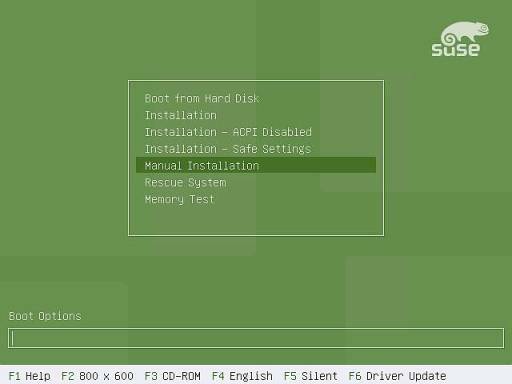 Wait till the boot menu displays. 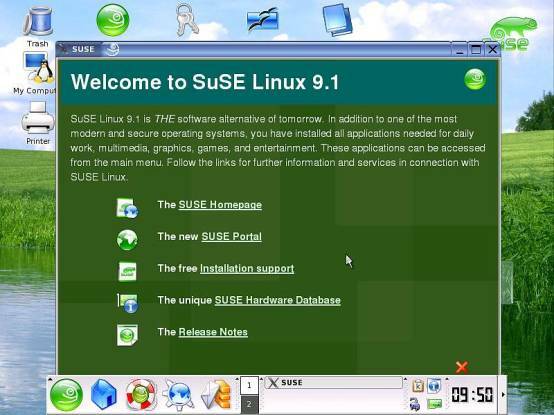 STEP 28: Booting SuSE Linux successfully. Done.